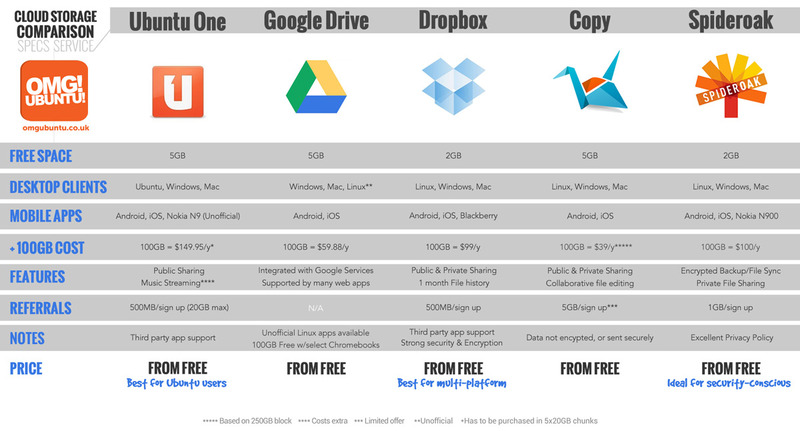 Review | Unity and Ubuntu – Tweaks you must know! Still unsure whether Double Fine’s Humble Bundle is worth the money and bandwidth? Eight prototype games from Double Fine were also added yesterday, but are only available for Windows. Beating the average also nets you Brütal Legend and paying at or above $35 also gets you backer access to Broken Age. If you’re dying to throw money at your screen, paying at or above $70 will also get you a t-shirt with worldwide shipping. A veteran of the highest grossing bundle yet, Humble Indie Bundle V, Psychonauts has been well-received – despite lacklustre sales – since its debut on the Xbox, Playstation 2, and PC in 2005. The protagonist, Raz, is training to be a Psychonaut and jumps his way out of danger and into the fray of summer camp politics and secret plots. 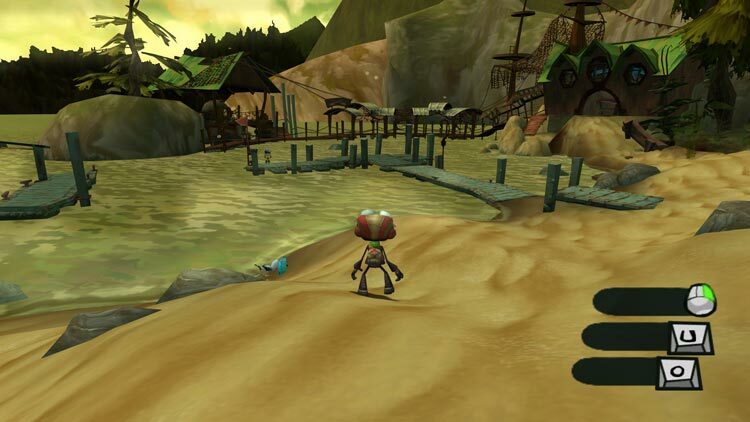 As a platformer, Psychonauts’ gameplay is rather straightforward. No need to awkwardly grip a ladder or trapeze – Raz will latch onto whatever he can when you’re close enough. Though this works well enough when you’re hopping around the camp and spacious areas, the finicky camera angles in claustrophobic settings left me replaying multiple stages as I overshot tightropes and trapezes repeatedly or Raz overeagerly grabbed onto another object in the environment. Regardless, the gameplay is downright fun even if it can frustrating at times. The dialogue is humorous – though certainly not as smart as some of the titles below – and the sound design holds up well for an eight year old title. The graphics tend to show their age when you crank up the resolution to 1920×1080, but this doesn’t detract from the gameplay nor should it. Psychonauts has lived on with a strong following despite its initial stumble in sales and some niggling gameplay issues and rightly so. It’s fun. It’s humorous. It’s deserving of its second Humble Bundle showing. Ever wondered what a world of matroyoshka dolls would be like? Look no further! Stacking is an adventure game that introduces a unique stacking mechanic into the standard fare of puzzle-solving challenges. You play as little Charlie Blackmore searching for his brothers and sisters across the fantastical world of stacking dolls. With his suspenders and flat cap, Charlie can sneak up behind other dolls, stack with them, and use their unique abilities to build up in-game achievements and solve puzzles in a multitude of ways. 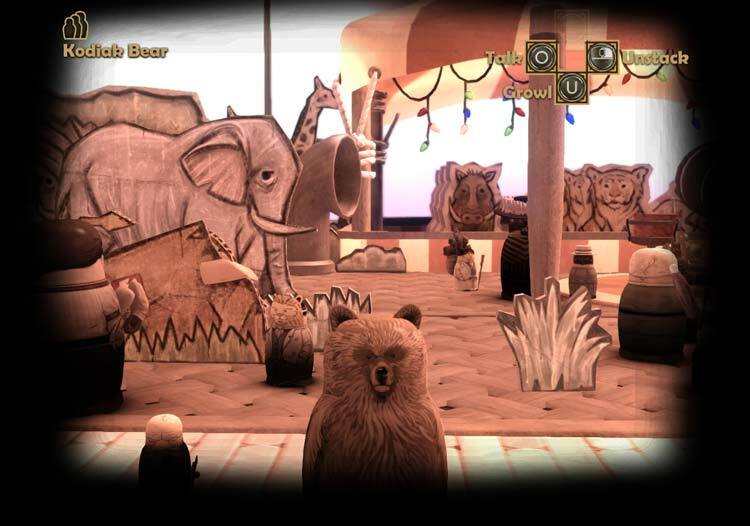 The sepia-toned cutscenes and sustained humour throughout the game complement the fluid stacking mechanic and the developers’ vision of this charming world. The music is particularly well-suited to the game’s atmosphere. The soundtrack available from the Humble Bundle only includes two tracks from the game’s classical repertoire, but the full list can be found here. Though the cutscenes are only silent films with title cards, the action and music blend perfectly to set the tone for the endearing adventures Charlie encounters. Ironic when set against hilarious situations and adorable when Charlie finds another one of his siblings, the music makes up for dolls that don’t always say or do much outside their special abilities. Aside from growling, the bear doesn’t move any differently than the pirate or the mime. Though the game’s sounds can leave the atmosphere feeling rather sparse at times, the music is perfectly curated and little Charlie Blackmore always leave you feeling warm and fuzzy inside. The premise is as cute as the name and artwork makes Costume Quest out to be: you and your brother or sister (depending on whom you choose to play as) go trick or treating and a goblin takes your other sibling. Whilst the concept is charming, the actual gameplay leaves a lot to be desired. Candy acts as currency in the game, allowing you to buy “battle stamps” that can increase stats during battle. You can find candy from going door-to-door, bashing pumpkins, and – alarmingly – rummaging through rubbish bins. Combat itself is rather lackluster. The quick time events that scream at you to “Press <key> now!” in all caps take away from what could otherwise be a rather adorable vision of a child in shining cardboard armour transformed into a goblin-fighting knight. Stacking’s well-suited classical soundtrack fits perfectly with the silent film aesthetic of the cutscenes and the lack of dialogue wasn’t an issue. 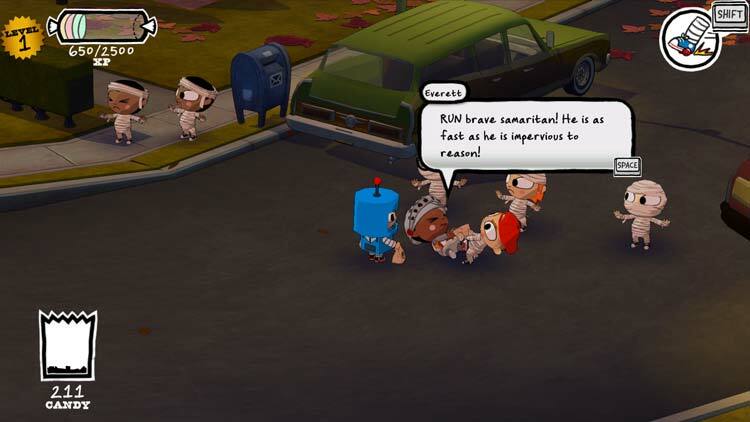 Unfortunately, Costume Quest’s dialogue feels interminable against a lukewarm soundtrack, lack of voiceovers, and sparse aural experience when the music dies down. Though this cel-shaded adventure RPG will please some, others – including me – will have a much better experience with Stacking. If you’ve finished your trick-or-treating, reassembled the matroyoshka doll, jumped your way out of psychic trouble, and paid above the average, you can hit the road as a heavy metal roadie in Brütal Legend. Transported into an alternate, oddly heavy metal-laden world by mysterious circumstances, Eddie Riggs – the Jack Black-voiced protagonist – quickly joins to free the human race from their enslavement. 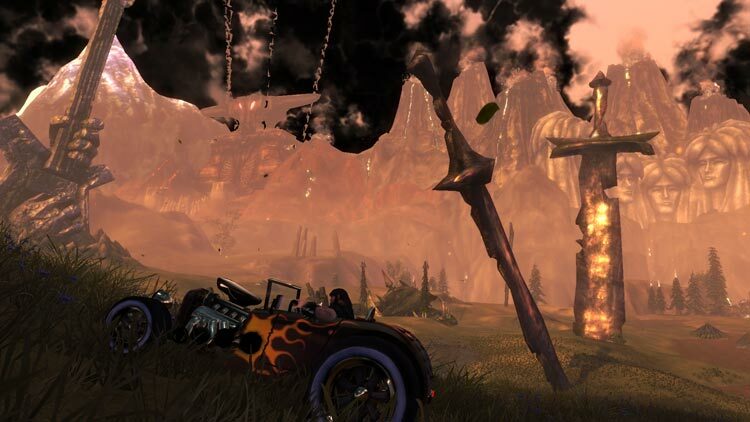 The massive open world is filled with odd creatures and post-apocalyptic ruins that are immediately open to exploration on foot or in your hot rod. But don’t let the open world deceive you. This is a real-time strategy game more than an RPG, so you won’t be spending time creating potions and hoarding wooden bowls in your inventory. Aside from the main storyline, you’ll only find secondary missions scattered across the map. The combat mechanics are a mix of simple hack-and-slash fun and seemingly tacked-on RTS elements. It’s difficult to focus on attacking enemies in front of you whilst needing to manoeuvre a horde of troops across the battle ground. These frustrating moments are unfortunate, but the rest of the action-adventure elements of the gameplay are fun and accompanied by satisfying sound design. Though many of us may not be metal fans, the soundtrack and aural experience in general mesh extremely well with the rest of the game. Jack Black’s performance isn’t as grating as I imagined it to be from past encounters with his work and the game’s atmosphere hasn’t worn thin on me yet. The often tongue-in-cheek, sometimes irreverent, but always good-natured dialogue and storyline make up for some of the oddities in the hybrid combat system. If you’re a metal fan too, this is definitely a title you shouldn’t miss. Though Broken Age née Double Fine Adventure has yet to be released, a purchase at or above the fixed tier at $35 nets you backer access to the project and beta whilst the game is still in development and the final game when it’s released. If you missed out on the original Kickstarter, this may be a fantastic opportunity to jump on board. Though Double Fine offers the same backer access for $30, you won’t get the four other titles with it. All four currently available titles can be downloaded from the Humble Bundle site. The Bundle comes with Steam keys and copies in the Ubuntu Software Center, though Brütal Legend is currently unavailable in USC. If you decide to purchase Broken Age, you will also receive a key that will let you register on the Broken Age site for exclusive backer-only updates, private forums, and the beta when available. Humble Double Fine Bundle Mega-Review OMG! Ubuntu! – Everything Ubuntu. Daily. This entry was posted in Costume Quest, humble, psychonauts, Review, Stacking on May 15, 2013 by unityadmin. Take a typical tower defence format, throw in some home-made visuals, and add a bevvy of BB pellets. What do you get? You get a stonker of a game, that’s what! Meet War in a Box: Paper Tanks by DQ Team – or as it’s more commonly known to me: ‘That game I spend too much time playing.’…. Each of the 24 levels in Paper Tanks has a start point and a end point. Between these an army of assorted ground and air vehicles will travel, vying to reach their goal. Your mission is to strategically position gun turrets around the track to pummel the pesky invaders with plastic pellets in-order to prevent them from reaching their end-point. To aid in your offensive you start each level with a small number of coins to spend on weapon turrets. These weapons vary in price and power, and need to be both chosen and positioned wisely. Choosing the right weapons at the start can make or break a game. Start a game with the wrong canon in the wrong spot – or even the right one in the wrong spot – and you’ll soon run in to trouble! From tanks to bi-planes, and armoured cars to Zeppelins – as the levels proceed the enemies you encounter become ever more varied and ever more resilient. Each turret can be ‘upgraded’ a number of times during the game by using coins earned from ‘kills’. As the game progressed the decisions in choosing which armaments to buy, where to place them, and when to upgrade them becomes ever-more crucial. Cranking up the tension is a set limit for the number of vehicles that can slip through; any more than 10 that successfully out-manoeuvres your turrets then you’ll fail the mission. Although Paper Tanks doesn’t deviate from this rather formulaic ‘start point, end point’ formula, there is enough variety in the vehicles, the routes they take, the tracks they traverse, and the armaments on offer to attack them to ensure that game-play never feels predicable. The paper-craft aesthetic never tires. In fact, even when having to replay a level for the umpteenth time I was always finding something new in the design to chuckle over. $3.99 on Ubuntu Software Center. 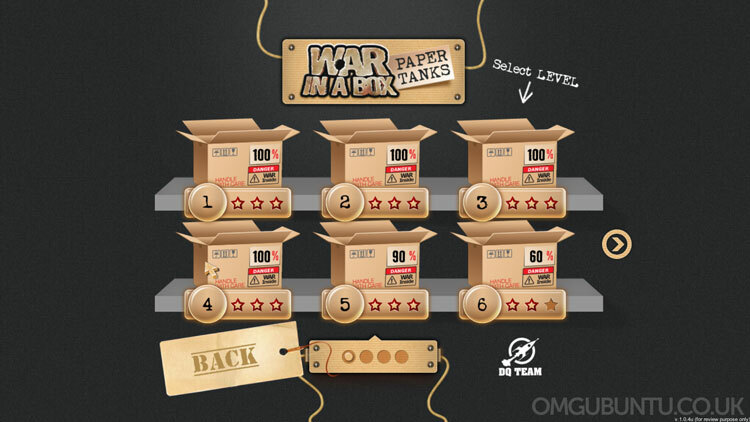 War In a Box: Paper Tanks is available to buy from various online outlets, including Desura. This entry was posted in Gaming, paper tanks, Review, tower defense, Video on March 24, 2013 by unityadmin. Two years after a successful Kickstarter campaign, indie developers Cardboard Computer offer a magical realist journey in Kentucky Route Zero. Taking inspiration from classic adventure games like King’s Quest and contemporary titles like The Walking Dead, developers Jake Elliott and Tamas Kemenczy focus on characters and storytelling rather than action and even puzzle solving. 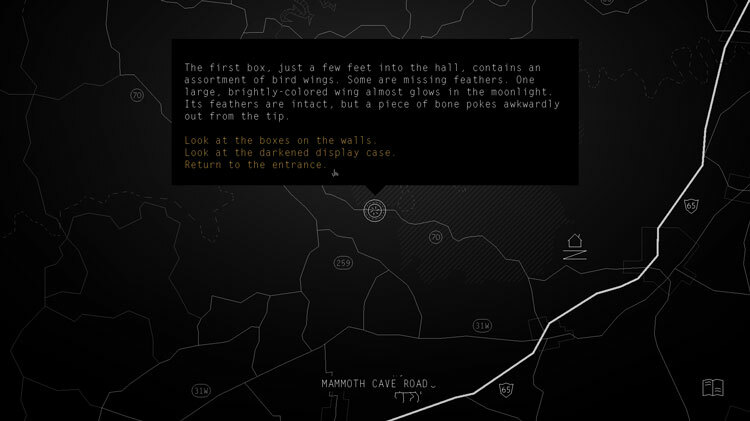 Kentucky Route Zero takes place over five acts – only the first of which has been released. You play as Conway, an antiques delivery man searching this humble corner of Kentucky (situated near Mammoth Cave National Park) for a mysterious delivery address. The narrative is as unpretentious and understated as your character. What starts as everyday, albeit strange, conversations can become fantastical scenes a click later. Disappearing characters and looming shadows are haunting yet intriguing threads woven into a rich and oft surreal narrative experience. Despite the focus on a literary component, the developers don’t lose sight of their audience or the nature of the experience. A scene that discusses a character’s “theorypoetics” is tongue-in-cheek yet captivating at the same time. The work never feels pretentious or strained in its treatment of the artistic forms on display or the magical realist genre itself. The only quest is discovery. The developers strike a balance between text adventure and graphic adventure, offering literary, aural, and visual experiences throughout your journey. As you search the backroads for interesting locations, some will open up through description only and others through explorable landscapes. As you make your way through the various locales and talk to various characters, the magical in the real complicates the question of what simply is. You’ll find yourself piling on the questions until the abrupt end of Act I. Though frustrating for those seeking resolution, explanation, and instant gratification, the fermata accents the endless possibilities of the magical realist story to come in Acts II–V. You won’t be combining items from your inventory in an episode of MacGyver but you will make narrative decisions that may or may not affect the outcome of your experience. The lack of puzzle solving, an inventory, and other traditional adventure game components doesn’t take away from the experience. The seemingly inconsequential dialogue choices open up characters and individual narratives unique to your own play-through and imagination. For players looking for cause-and-effect at every turn, this may be more tedious than intriguing; but there’s something oddly fascinating about choosing your dog’s name from a list or between a terse and inquisitive reply – especially when that choice doesn’t affect a play-through directly. I’m often tempted to skip through dialogue and backstory in games that feature uninspiring quests or banal characters. In Kentucky Route Zero, every character has a tinge of the fantastical, whether it reveals scenes of the everyday or deepens the enigma at the end of Act I. When you’re not directly exploring a location, you’re thrown into a simple, black-and-white map with roads and the occasional landmark. Exploration on the map is straightforward but unfruitful. Landmarks are far and few between, though are themselves intriguing. Sparse map, but intriguing locations. With the non-linear narrative, dialogue choices, one-time events, and easily missed locations, replayability is fantastic – indeed, I discovered an entire scene of Act I in a second play-through. 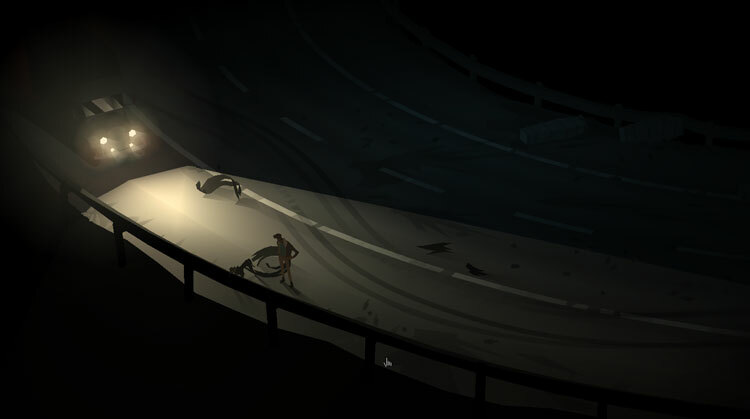 Kentucky Route Zero mixes simplicity with illustrative landscapes. The effect is a beautifully crafted world that is both indeterminate and painfully real. The play between light and dark reveals much in the shadows – some of a grim reality, others of a world that stretches slightly beyond your field of vision and time. The black-and-white map is as sparse as the handful of landmarks suggests, but the highway layout mimics the real-world location closely. Though the least successful component of the work, the attention to detail, even in its relative scarcity, leaves me hopeful for a more detailed map in future acts – be it visually or in the number explorable locales. Character models are unique, yet slightly under-featured, complementing the visual style of the surrounding landscape and individualising each character in the smallest details that are and aren’t present. At times your only companions are your dog, the hum of the truck’s engine, and the ambient noises that make headphones a must. Sounds of passing cars on Route 65 and the distant chirps of crickets liven up the black-and-white map. As there isn’t much interaction with the landscape, sounds outside footsteps are generally kept to a minimum, emphasising the haunting noises and aural events in scenes when they do occur. Though I expected some sound in the text-based exploration of some locations, the silence was distressing in itself. The soundtrack for Act I is fairly short – weighing in at four works – but the original score by Ben Babbitt and a folksy rendition of a hymn used at one location in the game are fantastic nonetheless. I hesitate to pin Kentucky Route Zero as simply a “game”. The debate about games as art rages on and this work is a prime example of the literary, visual, and aural talent required in crafting a unique experience amongst the throng of first person shooters and casual puzzle games. This is not to say that FPSs and puzzles don’t have a place, but that a work like Kentucky Route Zero stretches beyond the confines of “gaming”. Kentucky Route Zero is a work that taps into the traditional adventure game formula to create a meaningful experience far beyond what the notion of a “game” suggests. It is interactive art as much as it is entertainment. What may be a “boring” experience to its traditional market is a meaningful, poetic experience to another. The accessibility and depth of Elliott and Kemenczy’s artistry and artistic dialogue open the door for the magical realist adventure to come. Act I is surely the stepping stone to a vast narrative ahead, and Acts II–V are bound to leave gamers and non-gamers awed. Kentucky Route Zero is currently available from the developers’ website and on Steam for Windows, OS X, and Linux. $25 nets you Act I, the soundtrack, a Steam key, and the remaining four acts when they’re released “over the next year or so”. This entry was posted in Gaming, kentucky route zero, kickstarter, Review on March 9, 2013 by unityadmin.